It’s a total tourist trap, by-design— an unapologetically fake old-Western town with no shortage of Stuff to Look At. A smattering of giant fake dinosaurs, gobs of chicken fingers served cafeteria-style, a large collection of Western-themed artwork, taxidermy galore, and plastic totem poles painted to look like wood. There are souvenir shops that sell cowboy hats, fake geodes, and bright pink boot keychains that glitter. There’s also clean restrooms, cool beverages, and of course— the chance to stretch your legs for a minute and get some gasoline. It is an oasis for the weary traveler who doesn’t mind browsing a lot of useless items while taking a minute away from a dusty and barren stretch of road. But thanks to the 300-plus miles of billboards leading you there, it’s not just a rest stop. Depending on how you look at it, it’s either a triumph of advertising or proof of the tyranny of it. The thing about Wall Drug is that you can’t help but stop there. There’s something about that empty, long stretch of road that makes your eyes desperate to fall on something other than the yellow-brown of the high plains. Which makes those well-spaced billboards almost hypnotic, and means like it or not, you anticipate the next billboard and the next. Without anything much else to look at, your mind looks to create some amusement but also some order— so as one might look at a mile marker— you begin welcoming the next Wall Drug signage when you see it. About 10-20 miles before reaching Wall Drug, there is a plainer, brown sign mixed in with the others that seems to come up awfully fast. The small brown sign reads: “Badlands National Park, this exit”— at this point, you wouldn’t blame a driver for feeling unprepared to take action. By now, the driver is expecting hundreds of miles of fair warning before having to act. Not to mention, the same driver has been thinking ONLY of the number of miles until the Wall Drug stop-point for so long— and now, Wall Drug is only 20 away!! Stop now!?!? The sign contains no other information that might be useful. By this time, the driver has equivocated too long and flown right by the exit for the National Park. With a different destination in-mind, it is hard for people to choose a new direction mid-stream. Recently, I did this exact thing— I flew by the Badlands National Park Ranger Station and entrance because it took me by surprise, and rolled right into Wall Drug as originally planned. But it was not the high tourist season for Wall Drug, so basically nothing was open except for one or two food joints and a souvenir area. Stopping in one of the stores, I got the homemade doughnut I had been waiting for since 300 miles prior (maple icing, if you must know), but as I chewed, realized I was ahead of schedule in my route for the day. So I inquired with store staff about the Badlands— should I go back for it? Was it worth doing? A cashier said, “If you’ve never been, it’s really beautiful— and the whole drive is only about 20 miles, should take about an hour if you stop and take pictures.” She then offered dirt-simple directions that nobody could mess up— go to the stop sign, turn right, go under the underpass and drive seven miles until the entrance. Now, this was helpful information that could have been useful during that ferocious internal debate I’d had on the road— but with a National Park so accessible, it just made sense to go. I set out, following the painfully easy instructions, was waived into the park by park rangers, and went over a slight ridge. At which point, I was absolutely awe-struck by the beautiful mountains and valleys that lay in front of me. This did not look like anything I had in-mind when hearing the words “The Badlands.” I had expected more of the same flat dirt my eyes had gotten tired of looking at. No. This was otherworldly, like landing on Mars. Where had these chasms come from? These craggy and jagged peaks? How did something so flat and dusty suddenly become something so epic? As the sun set, the drive on the windy roads through the Badlands National Park revealed more gorgeous natural formations around every curve. My dog was happily occupied, looking out over the expanses, head darting this way and that, nose sniffing wildly. We were surrounded by a vastness that swallowed us. We contentedly watched the big-horned sheep as they munched on grass, and the prairie dogs getting the last rays of the sun. It was pretty magical— and surprisingly, there were very few other cars or tourists. Which got me reflecting a bit once I was back on the road. There were FAR more cars in the Wall Drug parking lot than I’d passed in the entirety of the Badlands road, which true to the cashier’s word— only took about an hour or so to complete. The Badlands were so beautiful— how could I have almost skipped it, especially in favor of a fake Western outpost? I was embarrassed for my oversight, and was simultaneously thrilled that I had inquired about the Badlands and remedied the potential wrong with a visit. A regular National Park goer— I should have had the foresight to know that National Parks are declared National Parks for a reason… they are nature’s most spectacular and special places. But… even given all that, I suppose I lost sight of that when given a different destination in the long-haul drive across South Dakota. 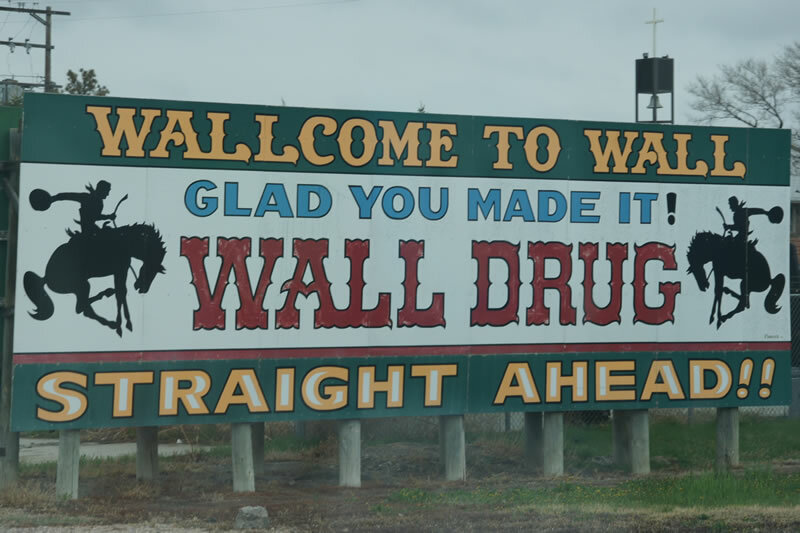 The advertising of Wall Drug, with its countdown of the number of miles until arrival— like it or not— did its job. I fell prey to the promise of homemade donuts and cool beverages like the sitting duck I was, and nearly prized that over some of the most epic and wonderful scenery of the trip. How did I let that happen? The short answer is that the government is in charge of many things more important than advertising their own National Parks— and doesn’t have the kind of money to promote them as say, private businesses. Perhaps we think of our National Parks as destinations in and of themselves— which of course, they are, until advertising offers something tantalizingly close but just beyond, and distracts you away. It is the most basic kind of premise— when advertising offers you something, it makes you want it. Normally, that’s not a big deal, as said advertising is competing against other brands on the somewhat level playing field of consumed media, and these brands simply fight one another for attention. But when about when well-funded private businesses use advertising to compete with something like a government-funded natural wonder? Is that even close to a fair fight? Or is it a small hint of the tyranny of advertising in general— messages that have the ability to supplant a destination you might really enjoy with one you never had in-mind? South Dakota is the Ugly American of Outdoor Advertising. Crossing into Wyoming on the other side, one is immediately struck by the total lack of billboards. And it feels like relief— the grasslands open up on either side, your eyes stretch a little further into the expanse— and you LOOK, you really look. You are no longer just scanning for the next billboard over that next hill, but instead, are genuinely enjoying the landscape.